I am NOT a morning person but I absolutely positively love the idea of being one. I’ve tried to be a morning person multiple times and failed each time. Why was this? Well, I was trying to be someone I’m not. My reasons for wanting to be a morning person were good. I wanted to be closer to God. Because, in my mind I was convinced this meant I had to be up reading my bible before the sun came up. That’s not realistic for me. First, I don’t function that early. Second, I truly feel closer to God throughout the day. I am not one to have a set time each day to pray. I prefer to do it as the day progresses. I thought I “Had” to. I became a mother, so that meant I should suddenly become a morning person and greet the dawn with a smile right? I’d set my alarm for wee morning hours. Which quickly turned into hitting my snooze button and wondering why I thought this was a good idea. I wanted to cook a healthy breakfast. Ha! For those of you who don’t know me, I’m not a cook. I don’t enjoy the process. I like to eat and prefer someone else to do all of the cooking. So for me, the idea of waking up early to cook a healthy breakfast was simply ludicrous. Toast, fruit and cereal is perfectly healthy for me and my daughter! What do all of these reasons have in common? They are completely unrealistic for me. I was trying to do what I thought everyone else is doing. That was not being true to myself. Every person is created differently. Why would I think that each of us should have the same “wake-up” time? But still, I wasn’t ready to give up on my mornings. 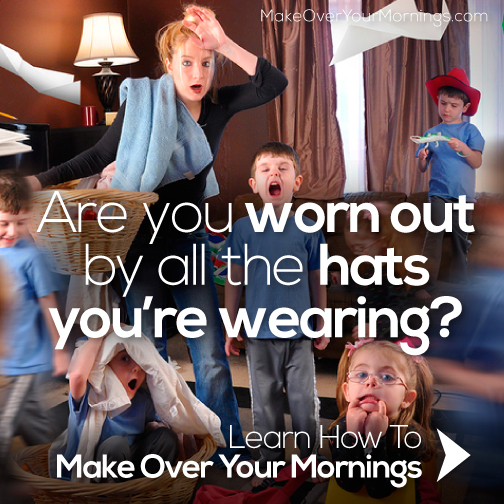 Then, I stumbled upon Make Over Your Mornings, a 14 day online course created by Crystal Paine. To be honest, when I first heard about it, I brushed it off. I mean come one. I’m lucky to have a few hours of morning that I’m actually awake for. Make it over? If that meant getting out of bed early, I wanted nothing to do with. I am SO glad I gave it a shot. First, Make Over Your Mornings is NOT about early mornings at all! The title says it all. Make over YOUR mornings. Not your friend’s or your neighbors. Yours. Regardless if your morning begins at 5:00 AM ( I hear those people really exist) or 10:00 AM, or even 11:00 PM, you really can make over your mornings. In a nutshell, in the course, you’ll learn how to set efficient routines to streamline your mornings (and evenings). Learn how to set your day up for success. This course is for ANYONE. I’ve even seen children go through it! It can be completed in 15 minutes a day or less. 15 minutes? You could do this course while drinking your morning cup (or three) of coffee. It is backed by a 30 day money back guarantee. Not sure about it, try out the first day of the course completely free! Let me know what you think about it. Have you tried this course? Did you see a change in your mornings? Looking for other ways to transform your life? Be sure to enter the “Hands Free Life” giveaway! Disclaimer: Affiliate links are included in this post. I full support this product and all opinions expressed are 100% my own. Affiliate links help me continue to keep this blog up and running. You are not required to purchase anything via these links but it is much appreciated if you do. Please see my disclosure policy for additional information. If you have any questions, feel free to message me. I love this post! I’m so tired of trying to live up to some standard I have in my head of what my mornings should look like. I also follow Crystal’s blog and have been curious about this course. I may have to give it a try after reading this– thanks!